This new Agapanthus blooms with stirking bicolored flowers which change from blue at the throat to white on the petals' edges. Flowers make up a giant 8" umbel. It's compact habit makes this perfect patio container, grows best in well drained soil and will flower abundantly in late June to September. Plant in well drained soil Not pH sensitive. 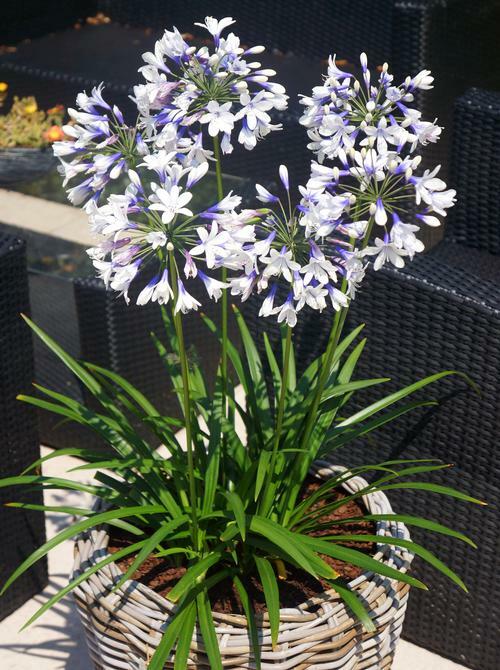 Agapanthus, also known as 'the flower of love', in Greek 'agap' means love and 'anthos' flower! Blooms in large, round clusters or umbels of blue, white or violet-blue. Prefers a well-drained soil and performs best in a warm, sunny location.